5793 labyrinths found. Showing 2281-2300. Sorted by country, state, city, then zip/postal code. Situated on private property - please call 203-327-9070 for availabilty. 5 circuit, accompanied by the 5 elements in a bagua shape. Classical 7 Circuit laid out with bricks at a private residence. Visitors welcome. Cut Lavender as you walk the paths of the Labyrinth! Experience the fragrance of 1500 Lavender in bloom as you find yourself; use fragrance to enhance your experience of self-healing. Merrit Parkway Exit 48, Trumbull, CT. (Please call first 203/261-0357). Take the linear park trail from the north side of a Community Lake Park. The labyrinth is approximately 300 yards on the right side of the trail. Closes at dusk with the park. Approximately 40 feet in diameter. Located on the Green. 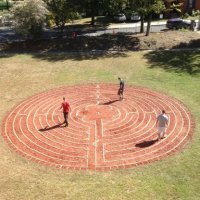 The labyrinth is in the Parish House (office building) that houses the church hall. It is diagonally across from the Meeting House/Church. The main entrance is in the courtyard in front of the child's playscape. Best times for availability are Monday, Tuesday, or Thursday afternoons, after 2 pm. Also, Monday or Tuesday evenings until 8 pm, by reservation, or by chance. Portable canvas petit chartres, blue lines. Not perfect condition, but definitely walkable. For rent or share. Will prepare group or individual events. Advanced Veriditas Facilitator. Canvas can be used indoors or outdoors; I have a tarp for outdoor use. Located in West Hartford Center (exit 43 off I-84) on the town green at the intersection of Farmington Avenue and Main Street. The church’s parking lot is accessible from Farmington Avenue. Alternative parking is available on South Street or the Isham Garage. Facing the building go to the far Right end, enter through gate and follow the asphalt path to the labyrinth which will be on your Left. From Rte I95, take exit 65. Go north on rt153 about 1 mile to McVeagh Rd. Go left onto McVeagh. The church is about 1 mile down on the right. Go into the entrance driveway, which leads behind the church to the upper parking lot, the Labyrinth is on the right. 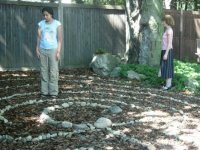 The Peace Labyrinth at the Unitarian Church in Westport. Usually on the eve of Solstices & Equinoxes, consult website to confirm exact date. Can also travel to other locations. Right off Exit 42 of the Merritt Parkway in Westport. One light north on Rte. 57. Turn right at light, Lyons Plains Rd. Right at #10, 1/4 mile on right. Usually on the eve of Solstices & Equinoxes, occasional additional dates, consult web site to confirm exact date. Usually combined with the Dances of Universal Peace. Modified 'Heart of the Chartres' with lotus petals. 41 08 N° Lat. ; 73 22 W° Long. On the Great Lawn, under the maple trees. 41.1421° N° Lat. ; 73.3568° W° Long. The labyrinth is on the perimiter road to the university. Simple and peacefull across from the parking garage.